I am not a New Year's Resolution person. I have never understood them. The logic escapes me. Especially when only 8% of the folks that make resolutions actually keep them. Why would I want to make a resolution that, ultimately, I'll feel terrible for not keeping anyway? I don't deal well with resolutions. I see a resolution as set in stone and unchangeable. Something that throws off my groove. I much prefer using the word goal. I can totally aim for a goal. With the added bonus of zero guilt if I miss it. A goal can be flexible and forgiving. It may be a matter of semantics, but it's what works for me. Taking a few moments to jot down a few goals for the year at the beginning gives me direction. I happen to be the most intense list maker ever so it's oddly therapeutic. It's also the only way to make sure I get anything done. I've broken my goals up into two lists: one list for the most likely accomplishable things and a second for the maybes. We are changing some of the money around because of our big ER visits last year that still have to be paid for and the washing machine is going out any day now. Some on the list are as cheap and easy as actually hanging up frames that I already have and others are as big as a new bed(see what I did there?). Some are fun, some are practical. I'm very good at starting but not so great at finishing so I'm hoping if I put them up here that I'll be a bit more motivated to get them done. Mattress for boys to share. Our boys seem to sleep better with a person beside them. We're hoping that it works as well with each other as it does for mommy and daddy. Because I'm tired. Container garden. We did this in 2013 without a ton of success. I'm hoping with some more research that it turns out better this year. But I've managed to kill three aloe plants in the last two years so don't hold your breath. More storage for downstairs powder room. A simple renter-friendly option like a behind the toilet shelf should work. Paint downstairs powder room. One to mark off the list already! I'll post about that soon! Window guards for boys' room. Put finishing touches on boys' room. Because I've been working on it for over a year now. I should probably finish it. New blinds and window treatments for kitchen. Repaint upstairs bathroom. Yes, the one I just painted a couple years ago. The color just isn't working. New bed for craft/exercise/guest room. New bathroom hardware and light fixtures. I've also decided that I may never have a rug for any room ever. Rugs are soooo expensive! We have carpet but some rugs to pull everything together would be nice. That's on my definitely not happening this year list. So what about y'all? Do you have any big plans for this year? 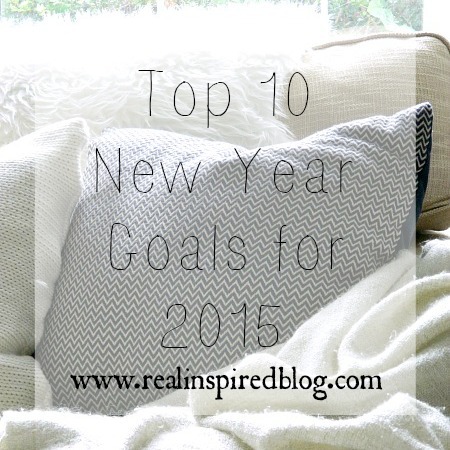 Do you prefer the term goals or resolutions? Helpful or Not? I'd love to hear what you're up to and what you think!